Going to the same place can never give anyone the same experiences and or memories as before. During the beginning of this trip and even weeks before the trip, I was worried. I was worried because last year was so good that I thought to myself, “What if this year does not top it?” Although I had my worries and doubts, I am extremely thankful for having to be on this trip. It wasn’t such a great start to my trip catching a cold and feeling achy. It was definitely the last thing on my list that I wanted to spend my time thinking and having to monitor my health closely. 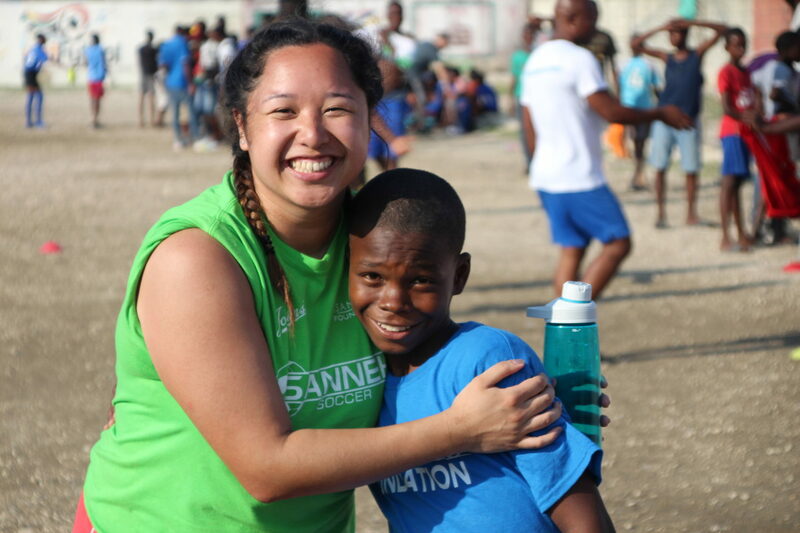 Although I had a cold, the people around me were so kind and made sure I was comfortable and doing well so I could create new memories during my week in Haiti. Now, as a volleyball player, I use my hands to contact the ball instead of my feet. However, during the entire week, I challenged myself to immerse myself in the sport, soccer. It was challenging at the beginning but I caught on quickly and was able to adjust. All I can say is that my favorite part of this trip was always the opportunity to learn soccer alongside these students who have nothing beside this sport that they love the most. They are so diligent and hungry to learn soccer. The kids were also very patient with me when I get paired up with them. Speaking of patience, I was randomly paired up with one of the girls during practice and you could just tell that she was not having it with me because of the language barrier between us and also my performance during the drills were just not best - granted I just got finished soccer practice with the first wave of soccer practice. After drills, we scrimmaged and when she saw that we were on the same team, you could see it on her face of how disappointed she was to have me on her team. Although she wasn’t a fan of me, towards the end of practice I was able to get her to crack a smile with me. She also was such a sport, she gave me a high five after our game. They honestly bring so much joy and smile to my face because of who they are, their love for soccer, and the willing and effort they put into practice during the beating hot weather. It amazes me to see how powerful soccer can be as a bridge between us and the Haitian people. I can say that every time I play soccer with the students, not only does my love grow for them but also soccer. There are so many memorable moments during this trip that comes to mind. One being, the chance to go on a walk around Cite Soleil to playing on the field with the little boys and girls, and watching the girls match on Friday before the day ended. The best was being able to see the girls, I trained with, win their match and congratulating them on their win. It was a victorious moment for them and Haitian Initiative. Another memorable moment, during this, match was seeing the community come together and watch/cheer on the girls. I am reminded, as we were taking a walk through Cite Soleil, to be thankful for the things I have and to love the most simple things I have even when I don’t feel like it. There are many times when our lives become so busy and we forget to pause and take a break but seeing the simplicity life they live and love they have for one another will be a piece that I take away back to the states and try to live by. The most simple game, such as jump rope, brought smiles to the little children’s faces and it radiates pure joy which brought me enjoyment. I definitely did not make the same memories like last year, however, I did make more great memories to add on top of my trips to Haiti. They will always be a reminder of why I go back to Haitian Initiative. Copyright The Sanneh Foundation 2017. All Rights Reserved.